One more tranquil day is ahead before the next storm system arrives on Saturday. The National Weather Service Storm Prediction Center has placed areas north of I-12 in a 2 out of 5 “slight risk” for severe weather and the remainder of the areas south, including Baton Rouge, under a 1 out of 5 “marginal risk” of severe weather. The main storm threat will be hail, and an isolated tornado is possible. Today and Tonight: Temperatures will begin to warm on Friday as winds shift southeasterly. Highs could scare 70 degrees. Otherwise, skies will continue to be mainly sunny with just a few high clouds. Those clouds will lower and thicken overnight as the next storm system approaches. Expect lows to stop dropping in the mid 50s. Up Next: Warmth and moisture will return as the next storm system enters the area on Saturday. Scattered showers and thunderstorms will begin as early as dawn. During the first half of the day, storms will be capable of producing hail. With any breaks in precipitation, additional heating will be able to occur which could fuel additional strong storm development in the afternoon and evening. These later day storms would have a better potential of producing a tornado. The most likely area to experience a strong thunderstorm would be southwest Mississippi and neighboring parishes in southeast Louisiana, north of I-12. As for your outdoor plans, some breaks in the action are possible, but keep the WBRZ WX App nearby and activated to check radar and have access to any alerts that are issued. Since it has been a while since severe weather threatened the area, remember to check up on your plans. A cold front will then push into the area overnight into Sunday with one last line of showers and thunderstorms. While that cold front will clear the area on Sunday returning sunshine, cooler temperatures will not immediately follow. 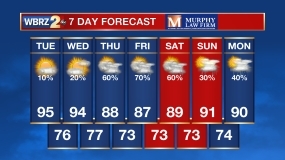 Those will delay until Monday, running five to eight degrees below average with more sunshine through Wednesday. 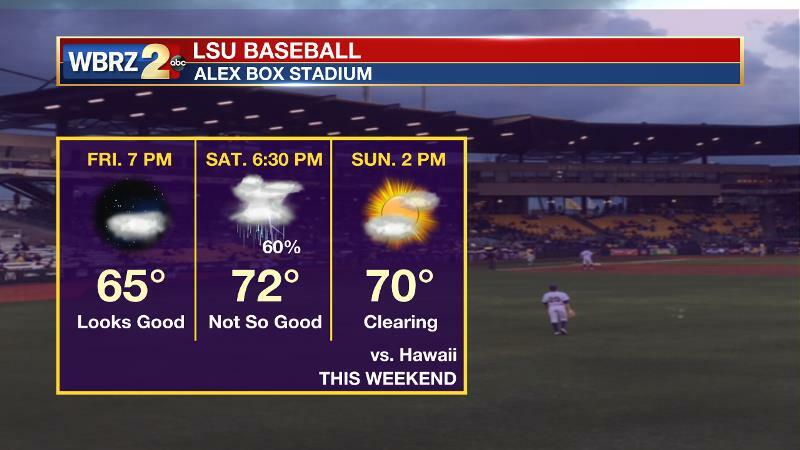 Given the timing of the front and accompanying rain and thunderstorms, LSU Baseball is likely to have delays or cancellations on game two of a three game weekend series against Hawaii. This contest is currently pegged for Saturday evening when rain and storm chances are high. Friday and Sunday games should not have any weather issues. The Mississippi River will continue a slow rise over the next two weeks. For the local area, from Red River Landing to Baton Rouge to Donaldsonville, the crest will occur around March 20. Given the current forecast, impact outside of the levees is expected to be minimal with the exception of soppy land around the Angola farms and by the LSU veterinary complex. The city of Baton Rouge is protected by levees up to at least 43 feet. On the river, traffic and industrial operations will be restricted. In New Orleans, the Army Corps of Engineers opened the Bonnet Carré Spillway on Thursday to prevent unnecessary pressure from being exerted on levees in the Crescent City. As an area of high pressure moves eats of the area, onshore flow will commence and afternoon temperatures will return to average on Friday. As a warm front develops along the Gulf Coast, warm and most air will continue to advance into the region on Saturday. This boundary will generate showers and thunderstorms beginning as early as Saturday morning. A strong low level jet stream will move southeast from Texas into Louisiana and aid development of thunderstorms. These storms will tap into very cold air aloft and have to potential to produce hail. Once the warm front is through, any breaks in cloud cover will lead to daytime heating and destabilization. At this time, there is some potential for surface based storm cells to develop Saturday afternoon and evening. Enough wind shear is available for some of the storms to be strong or severe and an isolated tornado is possible. For these reasons, the National Weather Service Storm Prediction Center has placed areas north of I-12 in a 2 out of 5 “slight risk” for severe weather and the remainder of the areas south, including Baton Rouge, under a 1 out of 5 “marginal risk” of severe weather. A front will sweep through the area Sunday ending showers early. Cold air will not immediately trail this system; rather another trough will dig into the Southeast by Monday. Temperatures will once again be 5-8 degrees below average with quiet conditions through the middle of next week.